biography Dewi Sartika this time the biography of the Indonesian national heroine goddess Sartika and then biographical articles to learn more about the history of the following services heroes let us see whether the biodata Dewi Sartika and influence and what he did to share credit for our country of Indonesia Dewi Sartika education major perperan He helped educate the nation in education.Let us know a little history of his life in the study of mother Dewi Sartika so we encourage a passion for learning and learning is always clever and let her take part in the continuing struggle for education. Let us thank dewi Sartika. Biography Raden is a warrior Dewi Sartika Indonesian women's education, a national hero, as well as a role model among the Sundanese.He along Kartini is Indonesia's leading female characters. Totality in the fight for education, especially for women in government recognized and awarded appreciation by giving him the title of national hero since 1966. Dewi Sartika is the couple's daughter and Raden Raden Ayu Somanegara Permas. His father was a duke in Bandung. Both parents were once exiled freedom fighters in Ternate (Maluku). Having both parents in exile, Dewi Sartika then in foster uncle (duke Aria) living in Cicalengka.Biodata Dewi Sartika Raden name Dewi Sartika date of birth Dewi Sartika Cinean, 11 September 1947DeathTasikmalaya, 11 September 1947 National Hero Award by the President Decree No. 152/1966Raden biography Dewi Sartika During his life, Dewi Sartika very determined to fight destiny and dignity of women. Since 1902, Dewi Sartika has pioneered education for women. In his house, Dewi Sartika teach family members and the women around him on various skills such as reading, writing, cooking, and sewing. On July 16 1904 he founded Wife school or female school in Bandung. The school is a training institute for women was first established in the Dutch East Indies.Wife School in 1913 and then changed its name to Virtue wife school. Organization founded in 1913 Virtue wife school in the shade tasikmalaya schools established Goddess Sartika.Tahun 1929 School virtue wife School Renamed again to Raden Dewi Sartika and by the Dutch Government woken major new buildings and complete.Since child hood Dewi Sartika educator does have soul. He used to teach reading and writing and practicing the Dutch to the children of the maids in Kepatihan. The pattern of learning is done in a way as you play so he is very dear young protege.Steps taken Dewi Sartika since this small impact area so the name Dewi Sartika widely known by the public as an educator, especially among women. 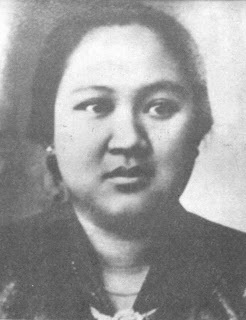 Dewi Sartika married in 1906, by Raden Kanduruan Suriawinata Agah who also works as an educator and the two have a common vision in advance to education in their communities.After the Dutch military aggression in 1947, Dewi Sartika take refuge together fighters who continue to fight to maintain freedom. At this refuge, Dewi Sartika elderly and Death of September 11, 1947 in West Java Cinean. Tomb He later moved to London.